Our friend Jose Pontes, a bi-monthly CleanTechnica contributor, recently posted an article detailing electric bus sales in China during 2016 over at the EV Sales blog. The figures allow those of us living elsewhere in the world to get more than a bit envious about China’s progress (those of us who don’t like breathing the exhaust from diesel buses, that is). Growth during 2016 continued to be quite strong, going on the figures provided by Jose, with some 115,700 electric buses sold in China during the year. This figure represents a roughly 20% market share for the modality in the country. 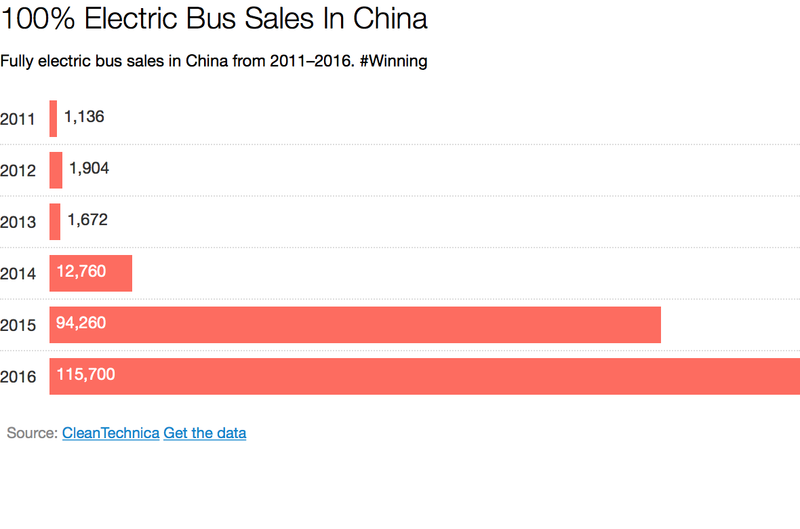 We combined the new figures with previous China electric bus sales figures Jose rounded up in order to create the following chart (a static, downloadable version is above). The top manufacturer for the market segment in 2016 was Yutong, with 21,428 units moved; followed by BYD, with 14,903 units. In third was Nanjing, with 7,921 units sold in 2016 in China; in fourth was Zuhai (~6,000 units sold); and in fifth was Hunan (3,410 units sold). “Ending a series of articles on China, I left the juiciest of them to the end, Electric Buses. In the end of 2015, China had 170,000 of the 173,000 e-buses circulating in the world. That’s right, 98% of them were zooming in The Big Red Giant, which I think says it all about the role of that country on the change happening towards eMobility. Impressive numbers — no doubt helped along significantly by the very friendly regulatory environment in the country (with regard to electric buses), and foresight on several levels.